Scroll down for part I and II or click here and here. Started the day with another spectacular gourmet breakfast at our “Buckingham Palace of Inns,” and then headed out to the streets to observe the “Quick Draw” event. Note to self: Next year bring art supplies and sign up for the “Quick Draw.” It looked to be a load of fun! To recap: The Quick Draw is quite a novel event to bring the art of plein air painting directly to the art lover. In Easton more than 130 artists, competition painters, professionals, amateurs, etc. had pre-registered and participated. These artists were then given two hours to complete their works within a three block area of the town. 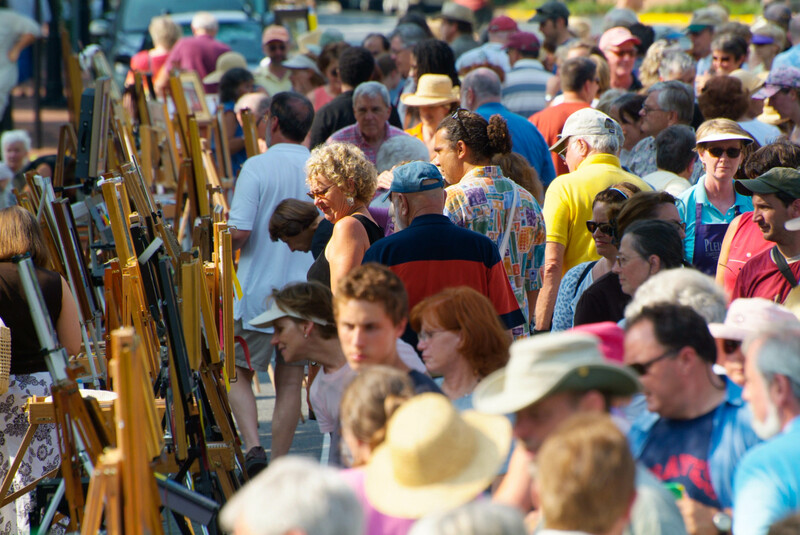 During this short time, all registered Quick Draw participants set up their supplies and paint, draw, or sculpt “en plein air” in downtown Easton, while hundreds of people stroll around and look in and ask questions. There were artists everywhere in this small Maryland jewel of a town! And they were not just painting the streets and beautiful houses and spaces around them! Painter Scott Powers, a young Chicago artist, was mesmerizing the crowd by delivering a portrait of a gentleman reading a paper in the shade of an Easton cafe. The crowd was hypnotized as Powers delivered a remarkable piece that not only captured the subject’s likeness, but also that key ingredient of great portraiture: the subject’s unique sense of individuality and self. How he managed to do that in two hours was a spectacular feat. We walked around for the two hours (I got a mean sunburn) and admired both the multitude of artists of all kinds of artistic skill, and also the multitudes of people admiring them. When the “finish” horn sounded at high noon, artists began filing down to Harrison Street, where they began to set up their easels to display (and sell) their just finished work. The paintings were then judged by Plein Air-Easton! Competition Judge Gay Faulkenberry and awards were presented at 1:30pm. By 2:00pm the exhibit and all of its paintings were gone from the streets of Easton. Once again I witnessed a near feeding frenzy as paintings were bought almost as soon as they were up on their easels. I would say that within the first five minutes about 50% of all the works had been sold, with works ranging in price from $250 to $2,000. By 2pm nearly all pieces were gone and heading to the home of a new collector. Larry Moore from Florida won the top prize at the competition and it was a well-deserved award - he was also my pick for the best piece in the show. I also quite liked Joe Meyer’s light-filled house (it also won an award), and Ken DeWaard’s piece. My wife and I then went biking around Easton (biking with my wife, who used to be a world-class triathlete before she retired from competition a few years ago, is like playing chess with Bobby Fisher) and then back to the Inn to get ready for my talk at the museum at 7PM. The room was packed, with maybe 150-200 people, and I had expected to talk for about an hour as I gave them a little background on art history and then discussed collecting art and other associated issues. The audience was really good and I didn’t notice anyone falling asleep or leaving, and so when I glanced at my watch, and noticed that I had been talking for nearly two hours I was dumbfounded by both my ability to just talk and talk about art and by the audience’s resistance! So I ended it (I could have talked another hour, but I took pity on them), and surprisingly quite a few people came over and started asking questions and I spent another 20 minutes or so answering them… so I think that it went OK.
My apologies for those who were late for other things because of my Castro-like performance. Next: the last day at Easton, with Winners Paint-Out and Brunch at Rich Neck Manor. While the “Quick Draw” may be new to the East Coast, they (and Plein Air Festivals in general) have been going strong out west for about 15 - 20 years now. Six years ago the Mid-Atlantic Plein Air Painters Association (MAPAPA - http://www.mapapa.org) began one of the first festivals on the East Coast with it’s annual “Paint Annapolis” event on the third week of September (this year will be the 6th event). Easton got the bug, and began their annual event, which is much bigger, with more of a national representation (not limited to a Mid-Atlantic organization). They’ve consistently done an amazing job, and it gets better every year. I understand it’s now rated as one of the best in the country (by the artists participating). More than other years, I felt the work this year was particularly outstanding, and may well try to compete next year. I hear it’s challenging, but loads of fun. Sorry I missed your comments Saturday night! I’d hoped to catch them, but my schedule wouldn’t allow. I’d wanted to run into you and catch up-we shared a table a few years ago at VisArts as part of a panel discussion on Art and the Internet. I enjoyed getting to know you then and always keep an eye out for you at events around town. Keep up the great work on reporting on the art scene! Three weeks after the event, I have really enjoyed re-reading your account as it brings back all the fun and excitement of Plein Air Easton.I agree with Todd Baxter Dawson that there have been many plein air festivals across the country, including Paint Annapolis. What sets Easton apart, however, is that from the first the organizers have been dedicated to keeping it an open competition rather than an “invitational”,as are so many plein air festivals. With the exception of the top five winners each year, no one is invited back and all must apply. This makes for some surprises as the judge is different each year, but it keeps the competition fresh and exciting. Also, our Quick Draw is unique in that it is not limited to competition artists…anyone can participate who registers and pays a small fee. In addition to the plein air competitions, the organizers have provided many opportunities for local artists to participate in different venues where they sell their work. The town of Easton goes out of its way to welcome all of the artists,and make their stay pleasant and financially rewarding. Thanks for your participation, Lenny, and we hope to see you again next year. I enjoyed your lecture immensely and yes, you were very funny! Copyright © 2008 ART-tistics Blog. Powered by WordPress.